At 5:30 the next morning, Clara and I caught the train from Keelung into Taipei Main Station, and from there took the bus south to Kaohsiung (pronounced “Cow-shung”), the largest city at the south end of the island. That ride lasted about five hours, and was the last uneventful bus ride we had until we were on the same leg back home. Taiwan’s public bus and train systems are among the best in the world: very nice, clean, relatively cheap, and easily accessible, all of which is true in the north, but no one ever told us about the south. 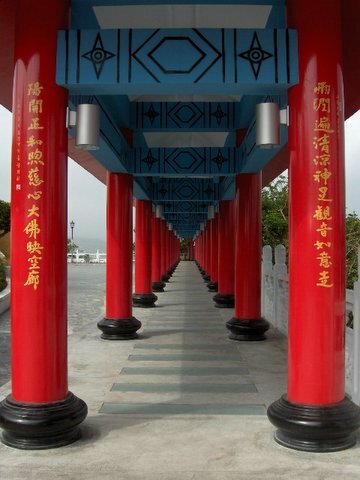 Clara and I were bound for Kenting National Park (“Kunding”), in the extreme south of the island. We were excited, happy to have a week off from work, eager to get out of the dense city for a while, and looking forward to seeing a new place. This is the only tropical place I’ve ever visited, and probably the furthest south too. As the bus charged southward, we exchanged wind and rain for warmer temperatures and softly overcast skies. We kept to the flat western half of the island, through miles of rice paddies, onion and corn fields, and the occasional clusters of burned-out industrial dinosaurs. It reminded me of a combination of California’s Central Valley and Ohio, mind-numbingly boring and yet a welcomed change of scenery. We arrived at Kaohsiung Station still happy, and caught the Kenting bus a further two hours south to the park. About an hour into the trip, though, our bus inexplicably pulled off to the side of the freeway and stopped. Some fifteen minutes later the driver made an announcement in Taiwanese, and everybody collected their luggage and got off. Another bus had arrived to take us the rest of the way; apparently this bus was having trouble. So I told Clara to go on ahead and get seats for us, and I would handle the luggage, so she did. I got our luggage and walked out to the other bus and waited in line to get on. Then, suddenly, the other bus closed up its doors and drove off! The rest of us, alarmingly left behind, were herded back onto the first bus and we continued on our way. So I continued on south to Kenting, in possession off all the luggage but separated from my translator. Oddly, even this new twist to our situation didn’t bother me all that much. Maybe a half-hour later the same fateful bus that I was on stopped yet again, and we were squeezed onto another bus. To this day I have no idea what was wrong with that bus. Luckily, Clara and I had our cell phones, and kept in touch quite frequently during the odd ride. She described to me where to get off, since I can’t read the signs, and we were happily reunited in the city of Heng Chun, which served as the public entrance to Kenting National Park. Across the street was the Heng Chun bus station, home to the elusive Kenting Shuttle. We went there, and luckily, there was one sitting at the door, ready to take us to Winson House, where Jennifer had reserved a room for us for two nights. We couldn’t believe our luck. We were the only two people on the bus, and the driver was friendly and talkative, though he mostly spoke Taiwanese, as did most people in the south, much to Clara’s chagrin. She knows a considerable amount of Mandarin, but not a word of Taiwanese, and that became her personal cross to bear on this trip. The bus headed off into the palm-covered hills, and we were treated to very pleasant views from its windows. A storm was moving in, and the same wind and rain we’d left behind in Keelung was now threatening our tropical paradise and making the waves crash hard and gray on the beaches. Some twenty minutes later the bus pulled into what we eventually learned was the tourist center at Jialeshui, which was technically just outside the park, and told us we could get to Winson House from there. Problem was, that didn’t mean anything to us. As the rain started coming down in sheets, he left us on this isolated spit of land that cost thirty quai to get to and could have been anywhere on the planet for all we knew. The tourist center itself was not isolated; there were plenty of poor employees selling seafood on ice, overpriced swim and surf gear, or a variety of other things; they eyed us skeptically. We couldn’t ask any of them how to get to Winson House, because we neither spoke Taiwanese nor did did we know the bed-and-breakfast’s Chinese name. Night was falling, we were soaked to the bone, and my translator was rapidly losing her cool out of raw frustration. Finally we got hold of Jennifer on her cell phone, who called Winson House herself and explained what had happened, and shortly a van showed up and drove us to the bed-and-breakfast, which turned out to be a half-mile down the road. The people there were very friendly, and like the devotees of any kind of dangerous adventure, were extremely laid-back, warm-hearted, generous, and had come from all over the globe. Many of them had come to work at the house in exchange for room and board and the opportunity to surf year-round. We were not the only English speakers there, we learned the next day, nor were we the only foreigners. Winson House was clean and simple, painted in vivid Mediterranean whites and blues, and all of its signs were in English. The let rooms had polished wooden floors and raised platforms with mattresses inside. We crashed hard on those simple beds, and awoke to piercing tropical sunshine the next morning. Our moods improved with the weather, and we walked back to Jialeshui to catch the shuttle into the park proper. The shuttles followed a figure-eight route, according to the map, stopping at a wide variety of sightseeing places and little tourist towns that had sprung up around them. The translation part of Clara’s brain was still asleep, so she put the planning of our vacation in my hands and willingly followed along wherever I deemed we should go. Our first stop was Longluan Lake, an inland body of freshwater just out of the city of Kenting that served as irrigation for the surrounding farms and also a stopover place for lots of migratory birds. We hiked trails through many kinds of palm trees and other varieties of plants which I can’t name, listened to disembodied bird calls, and visited the nature center, which was focused on birdwatching. Taiwan, even Keelung in the north, has plenty of herons and egrets, and I actually saw more of those in the rice paddies and fallow fields than at this lake. After we’d finished with the lake and its trails, we decided to move on to our next point of interest, and went back to the bus stop to wait. A galling hour and a half later, the bus finally showed up. The sun had set the temperature to 375, battered and flipped over me a few times, and by this time I was beginning to sizzle nicely. It was by now late-afternoon, and as the minutes ticked by I’d gradually whittled our list of sights to see down to one more, the national park service center, where I hoped to pick up some brochures, maybe catch a film about the area, and even buy some souvenirs. Nope. Instead, we got to visit that bus stop. By the time the bus showed up I was fuming, and Clara was laughing at me. Our roles had reversed from the night before: our navigator was losing her cool due to being stuck in one place for too long! On top of that, according to the bus schedule the shuttles stopped running at five o’clock. We didn’t dare visit anywhere else for fear we’d be left there overnight. So that was our disappointing day trip to Kenting: we visited one place. To be fair, there is a beautiful beach across the road from Winson House, and we spent some very relaxing time there. The sand was rough and volcanic black, and I began collecting stones from the beach. I realized as the sun gradually sank behind the hills and we walked the day's tensions off that even if I couldn’t buy souvenirs from this place and I hadn’t been able to see half of what I’d wanted to, I still had these stones, and the trip began to feel more justified and complete to me. After dark fell, thoroughly and impenetrably black, we walked along the shore again and studied the stars, billions of stars, a sky which I can only compare to Joshua Tree, lacking in artificial light. I took those stars home too; you don't get moments like that in Keelung. The next day we walked on the beach again, and then packed up and waited for the bus at Winson House – it turned out the busses did stop there after all – and yet again we had to wait an hour and a half. This time it wasn’t so bad, as we ate lunch while we waited, and also visited with the employees and other “surfer dudes” chilling there, but it did reduce the amount of free time we had on the other end. In Heng Chun we caught the bus to Kaohsiung, which thankfully did not separate us or break down, but it did run into some heavy traffic and so we were an hour late anyway. We found our hotel in Kaohsiung and immediately headed out again, because Clara had some places in that city she’d wanted to see. I tagged along agreeably; anything was better than sitting in a hotel room. We found neither. She didn’t know where they were, she was tired of asking for directions in Mandarin, getting answers in Taiwanese, and forcing them to use Mandarin until all parties involved were cranky. So we focused on dinner instead, and found a very nice restaurant that served hot pot – a kettle of hot broth cooked at your table, and you chose what went inside of it; a very popular style of dinner in Taiwan, and very good too. Kaohsiung is much bigger than Keelung (over a million people) though smaller than Taipei, and, characteristic of everything in the south, wider and less harried than Taipei. It was a pleasing city to be in, though I say that having been there in January and not the summer, during which the south of Taiwan is “hotter than Hades,” as it’s said. We spent an awkward night in a small but nice hotel room with one double bed – Clara took the floor – and a bathroom with only an etched-glass wall for privacy, and caught the bus north to Taipei. That ride was uneventful, and we were welcomed home again by gusty winds and rain. Now I have one day off in which to find my bearings again, wash the sand out of my clothes, and sleep some more before I begin teaching classes again on Friday and Saturday. All in all, it was a good trip, a beautiful place visited in good company, a place I’d like to see more of, though next time I’d make sure a personal car was in the picture. As always, you can click on the link on the right sidebar of this blog and email me anytime you want. I always like hearing from you.